Pedro Torres is the founder of Lucas Adam Financial LLC, a company who offers advanced financial and wealth planning services to both businesses and families. Pedro envisioned a very simplistic and clean logo, almost like what LA Autoshow produced for their own brand. They wanted to invoke a serious formal tone, because they are handling financial assets, but without leaning too much towards the “corporate” bank style look. After we getting all of our notes, we decided that our approach would be to go with clean, straight lines and stay within a one to two color palette selection that will allow us to fall in the middle of that “bank formality” yet independent, approachable feeling. 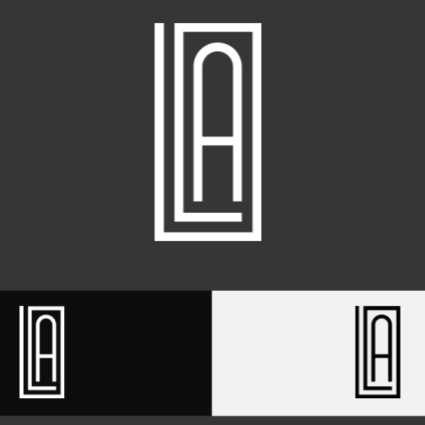 The First Concept: We designed an icon that combines the elements of a lighthouse and the company’s initials “LA”. The light house represents dependability, strength and timelessness, and it was something we wanted to reflect with the logo. The Second Concept: We took a more minimalistic approach that showcases a more serious structure. The blue, helps invoke the feeling of confidence, which is what you want your clients to feel when you are handling their assets. The Third Concept: We wanted to give them something that was out of the scope of what they wanted, to see if it would attract them. We created a rhombus full of color and used the “LA” ligature within to break apart the elements. Once Pedro and his team received the first round of concepts, they were gravitated toward the first concept and surprisingly (to both us and them) to the third concept. 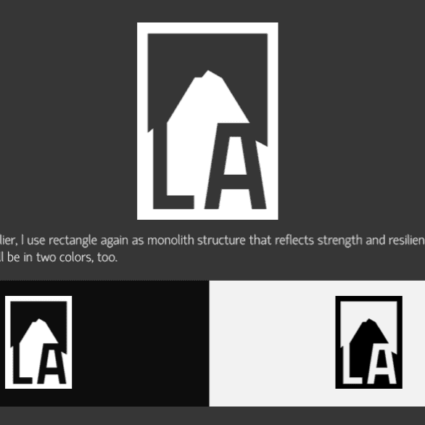 They liked the clean lines of the lighthouse icon but felt it was too busy and that the “light” drawing on top of the “LA” crowded the icon too much. They were surprised by how much they seem to enjoy the rhombus but weren’t married to it yet or to any at this moment. So we went back to the drawing board, and created a new concept and updated the other two concepts for them. 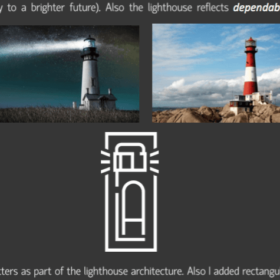 The First Concept: We removed the lighthouse aspect of the icon but kept the simplicity and stringency of the line style from the original concept. The Second Concept: We used the direction of a mountain to be the metaphor for the logo. 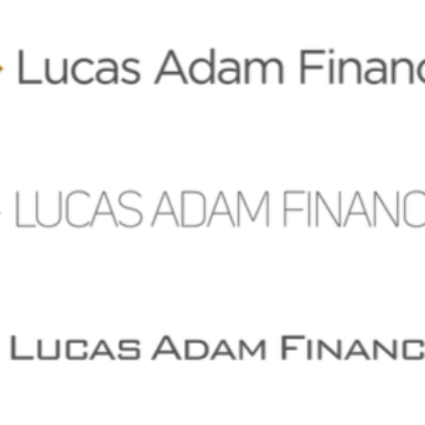 Mountains reflect timelessness, strength and dependability; which are characteristics that Lucas Adam Financial want to provide their clients through their services. We “carved” the letters into the mountain to emphasize a stronger and indestructible feel. The Third Concept: We kept the rhombus concept icon the same. Once Pedro received the new updates, he fell in love with the first concept but still had a gravitational pull towards the rhombus but still felt there was something missing to make it pop a little more, so we agreed to revise the both logos according to their notes. 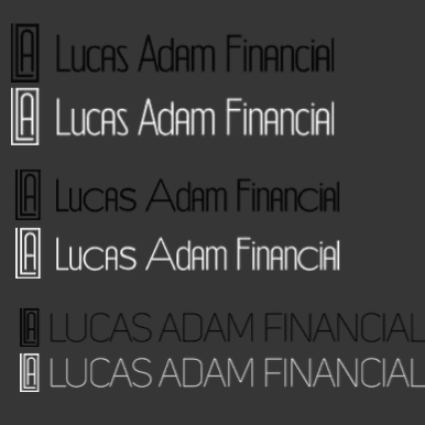 The next step was to select a font type that would match perfectly with the logo icons. For each concept we provided three sans serif options that we felt would offer the best fit. This allowed us to stray a little from the “corporate” feel that the client didn’t want to be too prominent. The Rhombus: As you will see, we added a gradient effect to the rhombus to give the element more texture and allow it to pop out more. Throughout the logo process, Pedro made sure to collect feedback from his team and his colleagues – 80% favored the simple LA rectangular icon in the beginning (Pedro included), while only 20% favored the rhombus. As we moved along in the process more and more people began to sway towards the rhombus. It was the colors that appealed them, how the elements were separated but still came together cohesively. By the end of the process, Pedro himself ended up choosing the rhombus logo and it was towards the end that he realized that all the tools that he uses to run his business actually matched the colors of his logo – this was mere coincidence… I mean we did that on purpose! The final logo is horizontal with the rhombus on the left hand side. We blew up the rhombus so you can see it in detail. Let us know what you think of the final logo below!